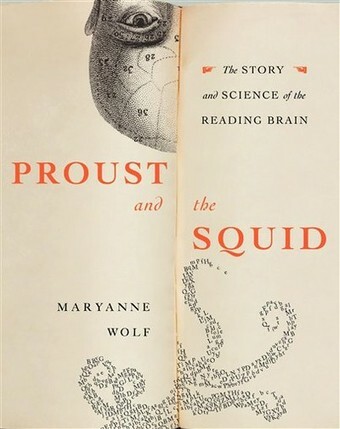 I finished reading “Proust and the Squid: The Story and Science of the Reading Brain,” by Maryanne Wolf, last night. If you know me in ‘real life’ you might be surprised to hear that I just finished it; I have been talking about it for what now feels like months. At the outset, the book was exciting — I couldn’t stop talking about the factoids and tidbits that I’d learned while reading. I made my mother (a teacher) read it. I’ve grilled friends who read it about what they thought. I’ve recommended it to still other friends. But most of all, I was excited to read more about how Wolf applied her new understanding of “the reading brain” to our changing definitions (and applications) of literacy in a media-rich, digital environment. Unfortunately, the conclusion of the book goes more or less no further than that. I still recommend the book (with similar caveats as this reviewer), but I was left slightly unsatisfied. The question of how our thinking is being impacted by technology is one a lot of people are asking. The New York Times recently ran an interesting (if somewhat hyperventilating) series on “Your Brain on Computers” that dealt with many of the swirling issues. I was a big fan of this piece, “We Need a Slow News Movement,” too. Wolf’s book is less concerned with understanding what technology might allow — that “profound generativity” that was so compelling in her opening passage — and more interested in how not to lose what we currently understand as literacy in our transitional moment. Personally, I try not to engage in any (well, ok, much) hand-wringing over how technology is changing our culture(s). I think there’s a lot of exciting, creative thrust in much of the technology we’re building. At the core of Wolf’s argument is that idea that reading, as a technology, freed up our memory and our brain processing to allow us to think more analytically, more relationally. Reading, it seems, teaches us to think differently about the world around us — not only because of the content of what we read, but also because of what it requires of our biological infrastructure. Therefore, it seems likely to me that many computing technologies evolving today may further alleviate the brain’s workload around particular problems of analysis, freeing us up to discover new ways of thinking beyond the limits of today’s literacy. Just like spoken language laid a foundation for the written word, and we still continue to speak and store phrases we’ve heard or read to memory, digital literacy will still require speech and written language as its foundations. The way in which we use and build those skills will, of course, change to better undergird our new digital literacy. How? Well, that’s what I was disappointed that the book didn’t address further. What does she means by “continuous partial attention,” and how is it different from reading books? Is the implication that when reading books, your attention isn’t continuous or it isn’t partial? Not knowing how she defines the terms, I feel as though my attention while reading the Internet is either continuous and full (or the opposite if different sites do not all fall under the same umbrella), and my attention while reading a book is not continuous and very partial. Unless you occupy some other part of your brain with music or exercise, it’s so easy to become distracted with your own thoughts and forget to keep reading… which may be the benefit. While she never defines “continuous partial attention” as such, what she’s referring to is the ubiquity of information that asks for your attention in the digital world. So many people — especially young people — are always constantly paying attention to a stream of digital information. She writes in the book — and I actually had wanted to write more about in this post — that your brain has delay neurons: cells that are tasked with actively slowing down information so you can process it correctly. It’s important for reading, and it seems important for the things she says literacy enables: analytical thinking, emotional connection with the content, etc. As I read it, Wolf sees digital culture as taking away a sort of macro-scale version of that. And she migtht be more right than she explained in the book, it seems: There’s been a lot of information coming out about this lately — that you need a break away from information in order to truly learn. Did you see this article in the New York Times? Anyway, I think her point (or at least her belief) is that non-digital text doesn’t demand your partial attention in the same ways, it seems, and that gives you more time to absorb/internalize the information you encounter.